Facet Joint Arthritis is a painful condition in the spine that can be caused by stress on the facet joints. The facet joints are cartilage lined joints in the spine. These joints normally stabilize the spine and prevent irregular movement. A lubricating capsule surrounds the joint and cartilage lines the joint to make bending and twisting movements possible. Facet joint arthritis, also called facet joint syndrome, facet joint disease, or facet joint osteoarthritis, is a condition in which the facet joints become deteriorated. What causes Facet Joint Arthritis? Facet joint arthritis is caused by stress and damage to the facet joints. This stress may be caused by intervertebral disc degeneration, but it may also be caused by back or neck injury or normal wear-and-tear over time. The stress on the facet joint will cause the cartilage that covers the joint to wear away, leading the joint to become stiff and swollen. The vertebral bones will rub against one another, potentially leading to bone spur growth on the facet joint's edges. 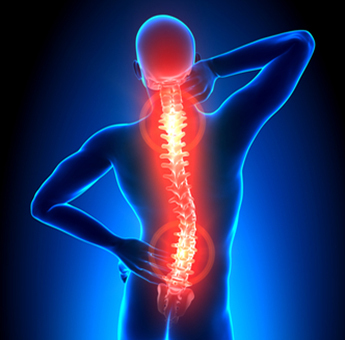 Symptoms of facet joint arthritis vary depending on where the affected area is in the spine. If the cervical area of the spine is affected, symptoms may include neck, shoulder, and upper or middle back pain. Headaches may also occur. If the lumbar area is affected, symptoms may include lower back, buttocks, and back of thigh pain. Diagnosis of this condition may be confirmed through the use of a facet joint block to identify the source of pain. Treatment options may vary according to the severity of the condition, but options often start with conservative treatments like rest, ice, heat, medication to reduce inflammation, and physical therapy exercises. In addition to helping diagnose the condition, facet joint blocks may be used to help treat facet joint pain. If the condition is very severe or if conservative methods have no effect, surgery may be necessary. Procedures used to treat this condition typically include facet rhizotomy or bone fusion.